Drip, Drip, Drop is screening at the Northwest Animation Festival! Drip, Drip, Drop, Artful Raven’s 2014 Exquisite Corpse animation was accepted for screening at this years Northwest Animation Festival! It is screening Monday Night, May 4th in the Northwest animation showcase Block. I’ve been invited to talk about it on stage at Sunday’s (May 10th) “Meet the Animators” Panel. It would be wonderful to see folks there. January’s challenge was SPACE. It was a topic I love playing with and we ended up with two wonderful snippets done by Myself and Levi Schmidt! You can watch them both here. To start us off, February is that wonderful foundation of SQUASH and STRETCH. 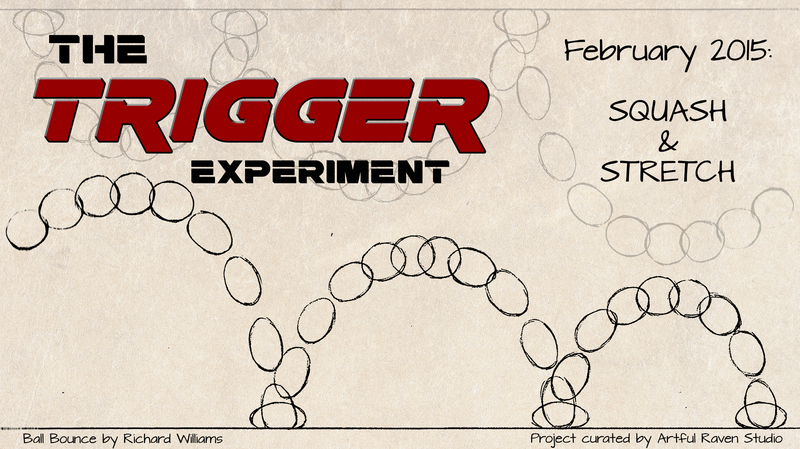 For those just joining in- The Trigger Experiment is a monthly animation prompt series for 2015 curated by Artful Raven Studio. Any animation medium, any style, teams or solo- it all works! Prompts are random, and announced here at the start of every month. They are due midnight the last day of the month. 1) Being a producer is no easy feat. It didn’t occur to me that I had landed in that role until the first animation deadline came up. Only 6 people met it. Which meant I still had 9 participants to rally! and lost some, so I had to find new participants with a shorter deadline. At the same time, I had to try to edit what I had and roll with it. 2) Deadlines are goals (only few are absolutes). This was a REALLY hard lesson for me. I had planned for a six week turnaround- this was a quick and dirty experimental collaboration after all. With scheduling participants, editing time, and my own life events, I had set myself up for failure- if all I was thinking about was the deadline. Yes, this was experimental- but I wanted the best quality, from everyone- including myself. A six week deadline, while giving a great push and fire, was not going to give this project the strength to bloom. As I rescheduled, I focused on polishing what I had in the meantime. The project is about a 2 month timeline. This will be my working goal for the next adventure. 3) Speaking of next adventure- I’ve had a number of people asking to be a part of the next Collaboration. This is wonderful to me- I want Artful Raven to be a place where people want to join, want to create, want to tell stories. This project has made me spread out from my creative island and build some bridges. This project will be complete in the next few days- All the animation is complete and my sound designer is making his final pass. I can’t wait to share this with all of you, trust me- it’s lovely.